A tool to keep any room tidy, the Amish Sunrise Raised Panel Storage Bench brings the country style and charm you love to your American home furniture collection. Enjoy storage and a cozy seat with this solid wood country bench. The Sunrise offers a bench back that is cut to resemble a scenic mountaintop. The raised panel of the bench features the same design. Arms are curvy and inviting, offering plenty of warm country charm. Working double duty for your household, the possible placement options for this solid wood bench are endless! Featuring soft close lid support, the Sunrise won't ever slam, making it even more of a joy to use. You select from eight different premium hardwoods with rustic versions also available for this custom made bench. Choose the stain and consider adding a cushion for the seat. 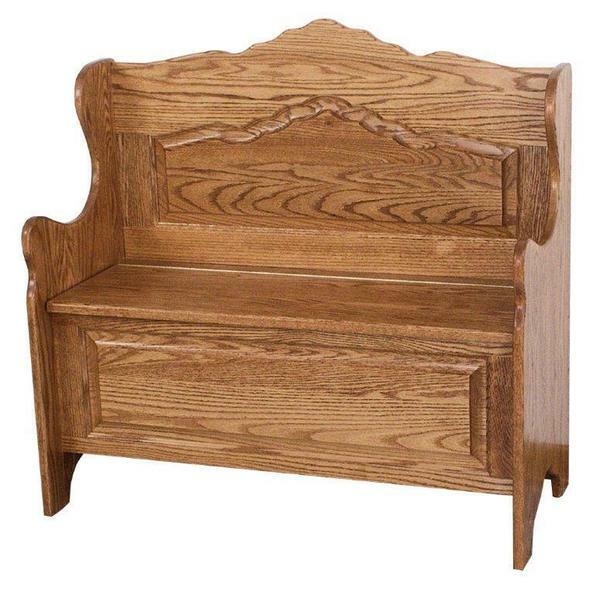 Take a look at more of our country furniture selections for other areas of your home. Width: 24", 36", 40" or 48"
As a follow-up to our order, I just wanted to let you know that it has just been delivered. Everything was in order, nothing was damaged, and everything was packed to perfection. All in all, we are very pleased with the whole experience, and would not hesitate in another such endeavour. I will try and remember to send you a picture, once we have the bench in place, when we take it out to our little paradise in Fairmont, BC. Thank you for all your help with this order.